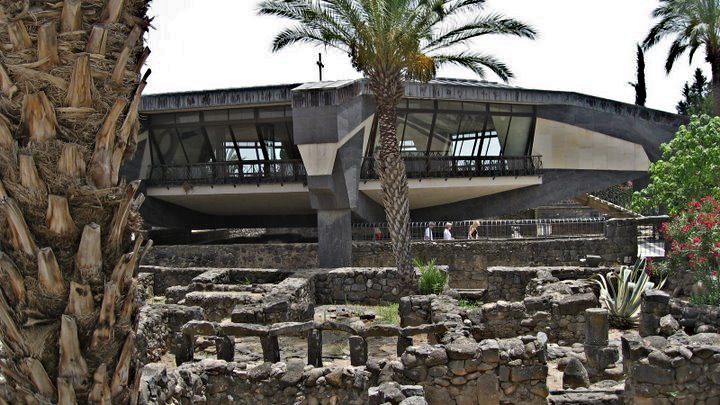 A fish-market and frontier post beside the Sea of Galilee, Capernaum became Jesus’ home town and the scene of many of his miracles. It was also the home of the first disciples Jesus called — the fishermen Peter, Andrew, James and John, and the tax collector Matthew (who as Levi collected taxes in the customs office). • Jesus and healed many people of illness or possession by the devil, including Peter’s mother-in-law and the daughter of Jairus, the leader of the synagogue. • Jesus pronounced a curse on the town, along with Bethsaida and Chorazin, because so many of its inhabitants refused to believe in him. Today an ultra-modern Catholic church, perched on eight sturdy pillars, hovers protectively over an excavation site. It is believed to have been the site of Peter’s house, where Jesus would have lodged. Archaeologists believe the house was in a small complex grouped around irregular courtyards. Drystone basalt walls would have supported a roof of tree branches covered with straw and earth — a fairly flimsy construction easily breached to lower a paralysed man on a mat, as described in Mark 2:1-12. Excavations show that one room in this interlinked complex had been singled out since the middle of the 1st century. Graffiti scratched on its plaster walls referred to Jesus as Lord and Christ (in Greek). It is suggested that this room was venerated for religious gatherings as a house church. If so, it would have been the first such example in the Christian world. In 5th century an octagonal church was built around this venerated room. The present church, dedicated in 1990, repeats the octagonal shape. Near the church, a partly reconstructed synagogue is believed to have been built on the foundations of the synagogue in which Jesus taught. Erected in the 4th or 5th centuries, this impressive structure with ornately carved decorations is the largest synagogue discovered in Israel. Its white limestone, carted from a distant quarry, contrasts with the local black basalt of the synagogue Christ knew. 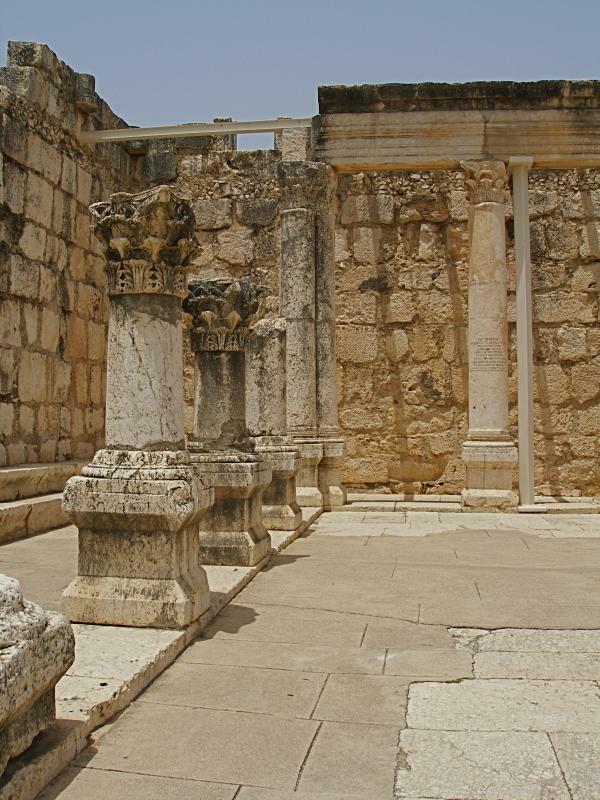 That original synagogue was built by a Roman centurion, the same centurion who had his servant healed after a declaration of faith that amazed Jesus (Luke 7:1-10). A short distance away, by the Sea of Galilee, can be seen the red domes and white walls of a Greek Orthodox church, built in 1931 and dedicated to the Twelve Apostles.